Our reef cruise was WONDERFUL! (Details and photos when I get back...) We met some great people and saw some truely wonderous sights. Most of all it was very relaxing... Something I probably will not be able to say about Sydney & Melbourne... Those days will be jammed packed! I am currenyl in the Sydney airport awaiting my connection to Cairns. They have a FREE internet connection & PC - since I was so not going to lug mine around! I was able to check my e-mail in Dallas too $.25 a minute... But our layover in Dallas was short - so nothing beyond reading my e-mail. I appliqued two blocks and played a few games of Scrabble to pass the time. Well, I better get back to my gate and husband. 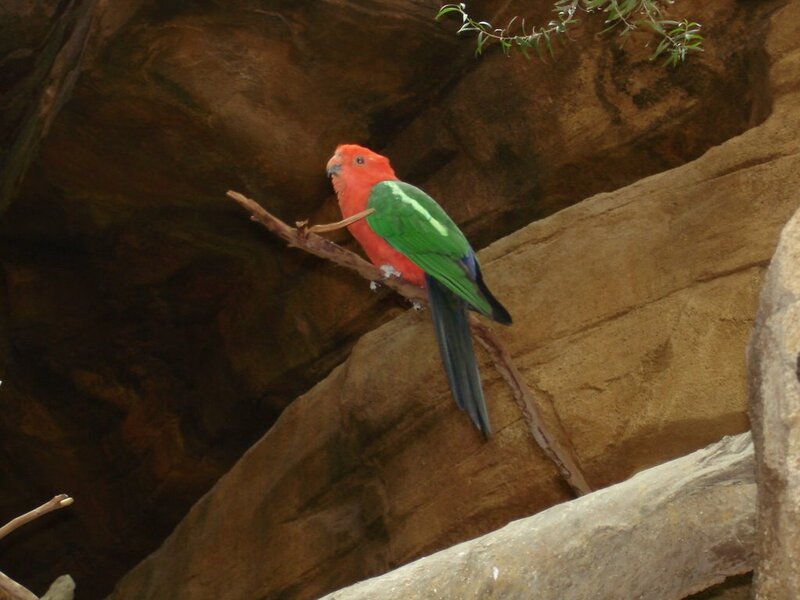 I will be in Australia until June 6th - I can barely get into my blog when I am away from my computer, so I am doubtful about any postings while I am away. I will be back & armed with some serious photos. The kitties are about to go to Kitty City & based on the lovin I been gettin, I know that they know something is up... Don't tell me they aren't smart. So ya'll come back now! - in a few weeks. P.S. Sorry I did not reply to my comments today, Yahoo<->Blogger are not connecting very well today. Meanwhile Barb just got a really nice post card in the mail all the way from France! And in the mean time, I just noticed - or re-found it since I am now postcarding a great tutorial on DebR's blog. Mine was created differently - OBVIOUSLY! but I could have used the satin stitch hint.... Live and learn. Maybe my "middle product" is new - I don't know but it is called "Fast 2 Fuse." Similar to Timtex, but the fusible is on the interfacing on both sides! Well, it is almost embarassing... 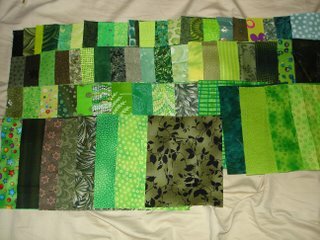 I easily found the 24 (actually 32) "extra" greens that I wanted/needed to make my zipper quilt longer & still scrappy. First I told you about the greens that I knew were in my cats on stars travel applique project. I though there would be 4 or 5 in there that I had not already used - make that 8 or 9. My hand dyeds are right near that box as is a pile of Orientals (I am not sure why they are "out" they have their own box too...) So I pulled from both of those stashes too - Uncounted number of hand dyeds. You see I came to my senses before chopping into them... 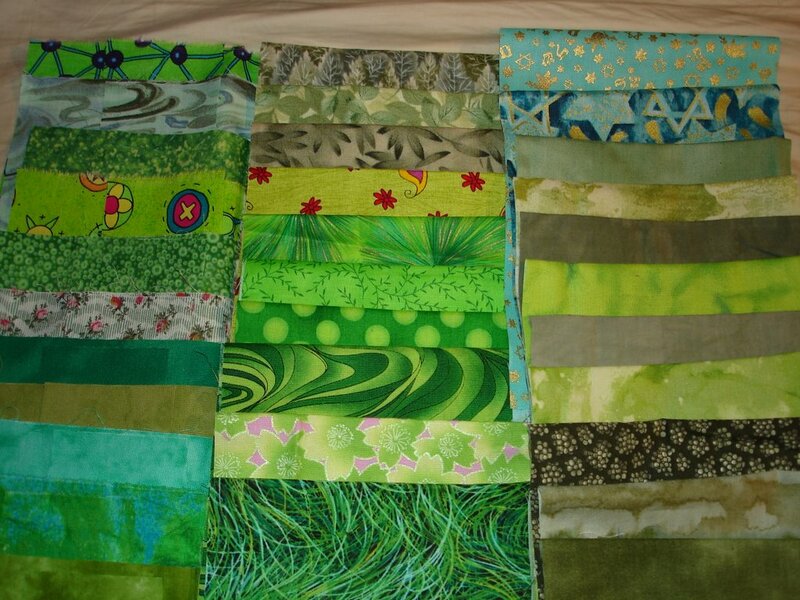 I got a great deal on a big scrappy bundle at a show once & I have a friend who dyes & gives the fabric as gifts - I have a few of her greens... Not to mention my friend who makes her living as a hand dyer... I have a few of hers as well, but not so many in green. 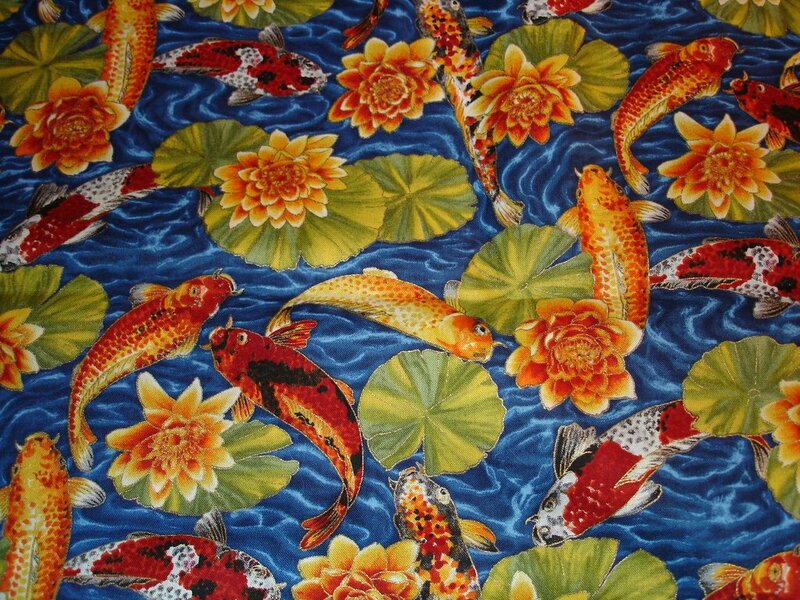 Only a few green Orientals - none of which really made the cut for this quilt. 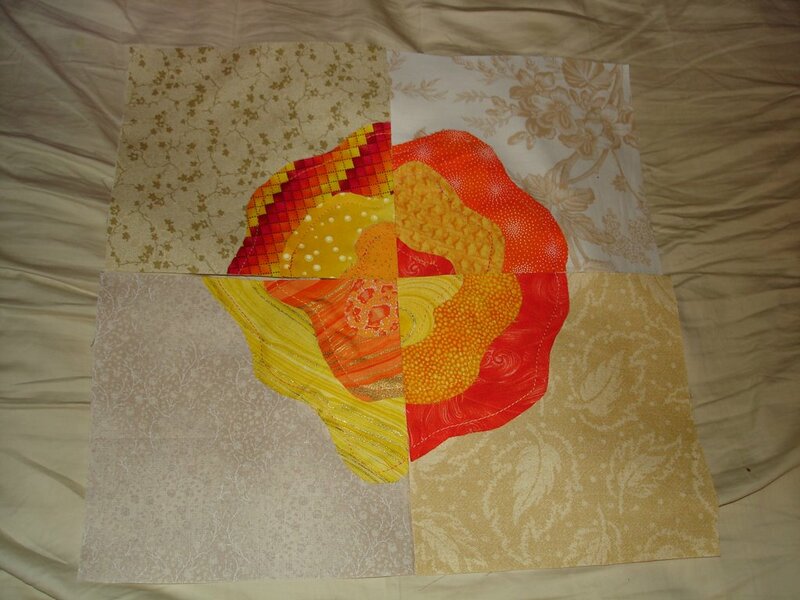 No batiks (only had 5 greens any way) or Orientals, no novelties, & only a few hand-dyeds made it into round two. Did anyone play my MEME? I read mysteries (almost exclusively). In general, I like the style of Sue Grafton "A is for Alibi" & Nevada Barr "Track of the Cat". I also like some of James Patterson's books. I can tolerate Lillian Jackson Braun. I don't care for the Midnight Louis series. Do you know of any authors that are similar to these that I might like? I was Specifically wondering if anyone has read: Edie Claire "Never Tease a Siamese", Carolyn Hart of the Death on Demand Mysteries, or Marian Babson "Please don't Feed the Cat." I checked these out from the library & would be willing to go exchange them if you know that they are not my cuppa tea! Do you think I would like them? Can you tell me a bit about any books that you have read by these authors? I Do and I Don't It's a meme. I do love to meet new people. I don't often come across as very friendly. I do have strong political convictions. I don't feel the need to tell everyone about them. I do respond to email. I don't make phone calls if I can possibly avoid it. I do love the water. I do love my cats. I do need to diet. I don't care enought to seriously do anything about it! I don't like all of the details that it takes to travel. I do love spending time with my extended family. I don't like all of the craziness that surrounds it. I do participate in organized religion. I don't think everyone else has to & those that do, don't have to do it like me. I do appreciate my husband. I do like to be tagged for MeMe's. Well for my weekend adventures, I planned to make and mail my May Project Spectrum Green postcard... I got it made, but not in time to mail it! So I'll stop by the post office today on my lunch break. In my mind it should have worked out perfectly, but in my mind the zippers had 7 teeth not 5, so the block would have been rectangular in the up and down way instead of slightly rectangular on the across way... technical jargon for ya early on Monday morning! I am still trying to hold out on buying that "perfect" fabric for the border until after my trip to Australia in 5 days (we leave on Friday, but I will be off line as of Wednesday afternoon. Until when? I'm not 100% sure... I doubt that I will get online while in Australia, but wilder things have been known to happen...) Oh, how long did you think it was going to take me to mention the trip? In the meantime, after I pieced together my zipper and my postcard, I finally changed the thread in my machine and top stitched my April Orange bulls-eye flowers from last month! As you can tell from the photo, I even sliced and diced them and sorten them into blocks! Although I may "stagger" the blocks - you know where you have a 1/2 block on the top of one row instead of all full blocks - just to do something different! Now it really is setting in that we are 7 days away from a FULL day in airports or on planes - can you say "Applique." FULL - wondering about the emphasis? Our first flight leaves at about 11:30, you need to get to the airport 2 hours earlier we are taking public transportation, so we need to get on the 7 a.m. bus to the subway to the train to the 9:15 shuttle bus to the airport. (We could have taken another bus inlieu of the train, but doing that would be tempting the traffic fairies.... The trains do not get stuck in rush hour traffic....) We fly to Dallas (rather short layover) and onto LA where we have a 6.5 hour layover. We finally get on Quantas to Sydney at 10:30 p.m. I am calling that a FULL day in airports or on planes. 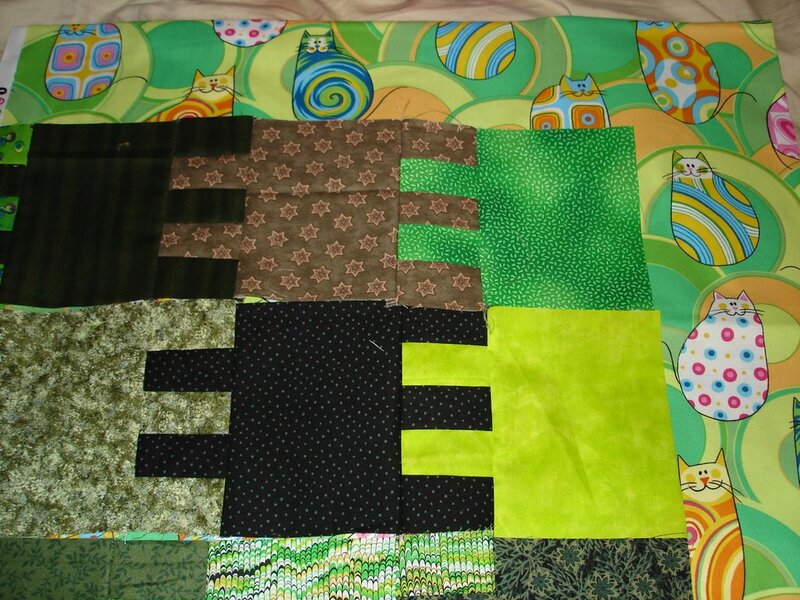 And I am bringing my kitty blocks to applique (I only need to thread baste two or three more then I can pack them! ), maybe even a book - in addition to our travel Scrabble game. Back in January (on the 8th) Barb at Woofnanny told about her "adventures in doggy sitting" (not her title - my blogger embellishment - play on an 80's movie title.) Specifically, an overdose on "freshies" which are a version of "greenies" a doggy treat. Based on my current project, can you guess why I am mentioning that here, now? My zippers look like "E's!" Yes they do! Do you see the "colorful" green? The only "planning" that I am doing is trying to keep the "colorful" ones apart & in different spots on their rows. Everything else is pretty much the next one in line. 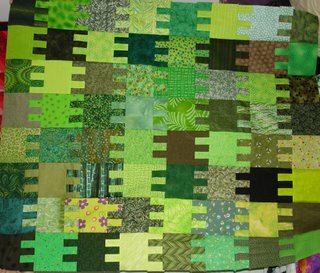 However, I have a choice between two sides on which to place the next green, so I am trying not to have lime next to lime, etc. My rows are not sewn together, that will be my last chance to order them around nicely. Thanks for all of the lovely comments about my cat block. 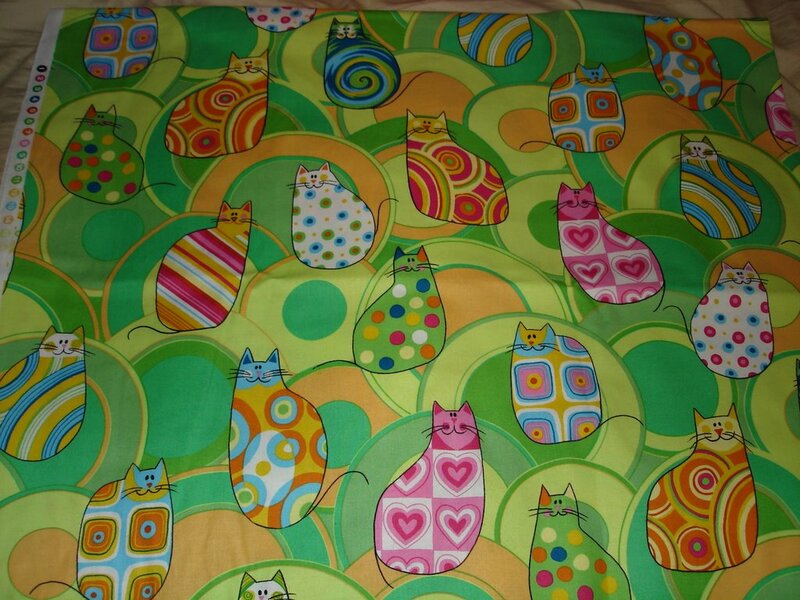 I have been "collecting" cat fur fabric for a long time... In my collection, I have a lot of "marbled" as in marbled paper, not Moda marbles fabrics as well as pieces that might have been intended to be people hair to nice tone on tone browns, grays, oranges, etc. I have an official cat fur stash... I had no idea how extensive it was until I pulled fabrics for this project. 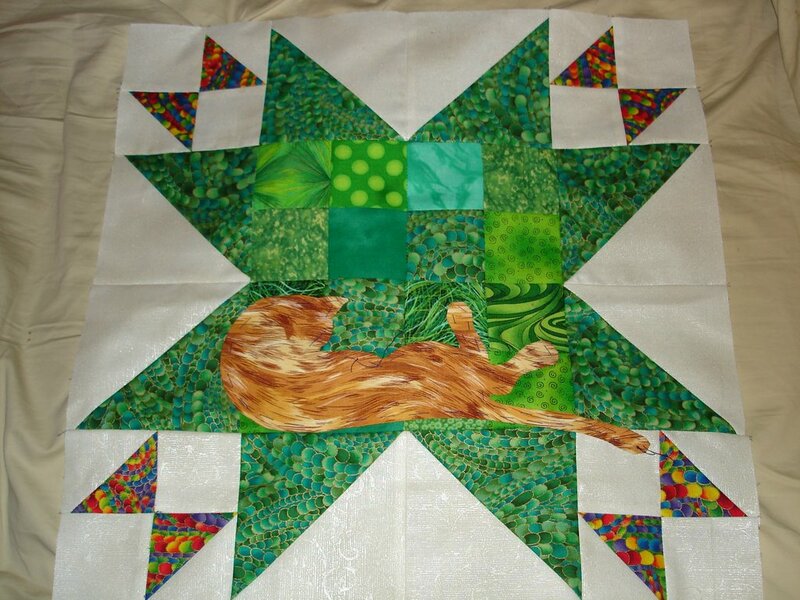 This project uses 15 different pieces - I could have easily made 30 without getting into mixing teh fabrics to make "Siamese" or "calico" cats! First off, I've finally uploaded the pictures from my recent Aquarium visit... (I'm only posting a few - for my memories more than anything.) 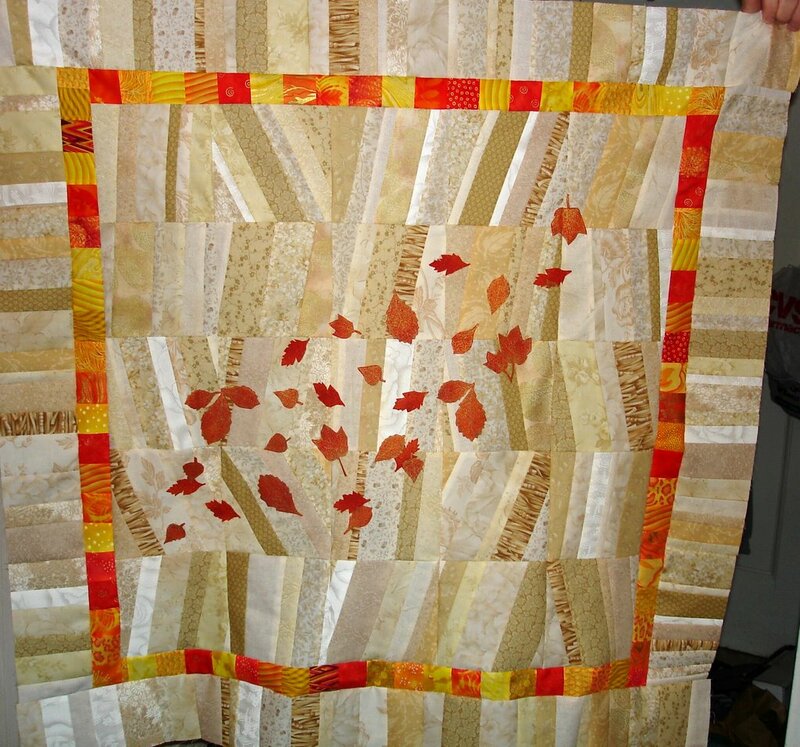 Scroll down for something quilty - including a photo. 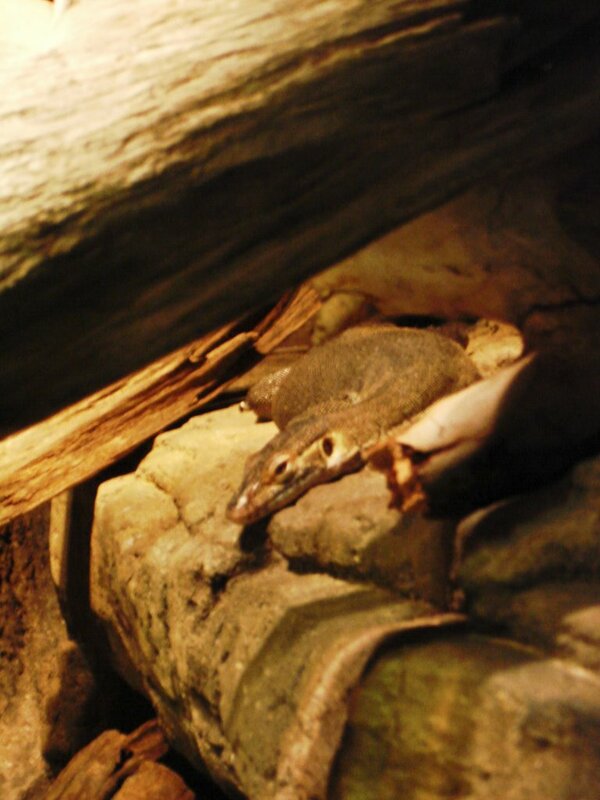 The Aquarium photos include an Australian bird (I forgot to annotate names) and a monitor. 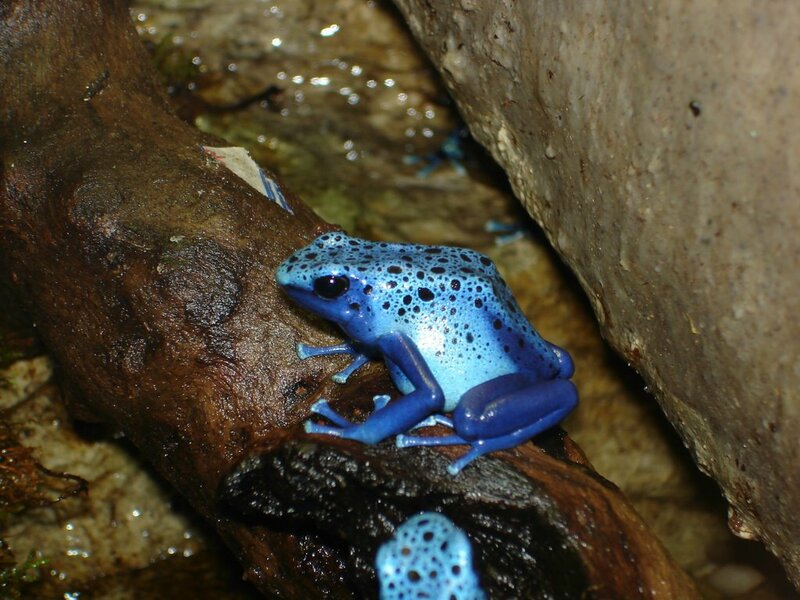 The frog is from the new frog exhibit, although they have had frogs in the rainforest part of the Aquarium for years, including thise LOVELY blue variety. He is poisonous, but purty nonetheless! Greens! Well, I originally was only going to use 30 greens, that has expanded to 64! All from my stash! 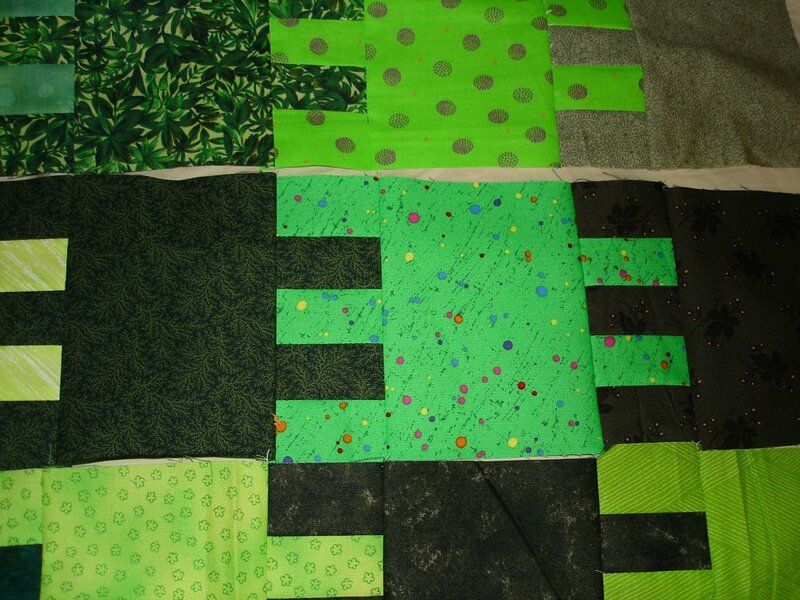 (You have to realize that most of my stash is comprised of under 1/2 yard pieces. More like fat or long quarters. 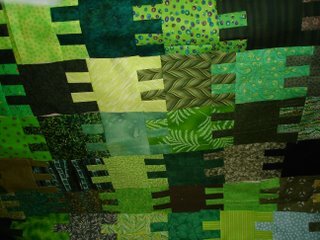 Another tidbit on this quilt, A design wall would be helpful, but I am going to wing it on what goes with what & hop that I don't get too many next to each other when I start to join rows. Do I have a thing for greens? No, not really. But I like scrappy backgrounds, so when I wanted a scrappy lime background (for somethig that never got made - so that fabric moved into my stash), I bought several lime greens! (I have another lime & white stripe for the binding.) Some I bought for other as of yet unmade quilts, but they will be scrappy too, so I figured that I could take a bit for this quilt now - part of the reason I was able to jump from 30 to 64! Not to mention that I have a few cat fabrics with green backgrounds.... Some of which that have tiny cats, so that they read green.... But while I was in my storage locker & I did look in on my cat collection, I did not sort through or look deeply for any "green" kitties! While at the aquarium, we saw some of the other exhibits too, including the new frogs the rainforest & the feeding of the rays and the sea turtle - now that was FUN! So now I am back at work & it truely fells like a Monday. (I often come into the office on the weekends, so they always seem short.) So much so that I was thinking, I'll have a lto to read on the ring, because several gals seem to only post on the weekends.... Suprise, not much going on in blogland. Then it hit me that it is only Friday! 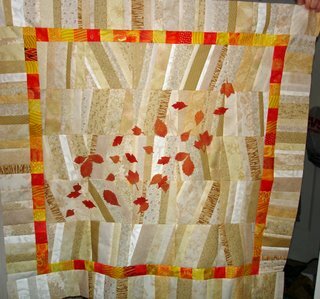 Back to something quilty.... Unlike many "zippers" that I have seen where the same fabric is placed in different locations on the quilt, mine will have 30 different greens on a 5 x 6 layout. (I only sorted and counted and culled last night because my kitties missed their mommy & needed a lot of attention.) Tonight I hope to start cutting! Mine will be more like Sam's only in greens! I had a ton of fun pulling greens last night for it! Is that it? Must be because March was Red & Pink and April was Orange & Yellow. 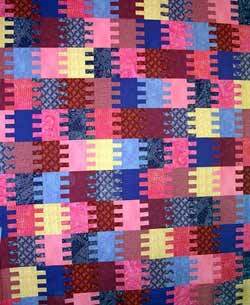 I hardly ever make mono-chromatic quilts... My stuff is usually scrappy to the hilt! 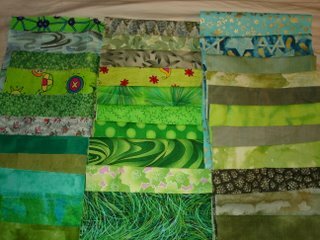 I have been thinking "new Green quilt" & I either cam up with new Jets quilt (not happening until the other one is worn out!) 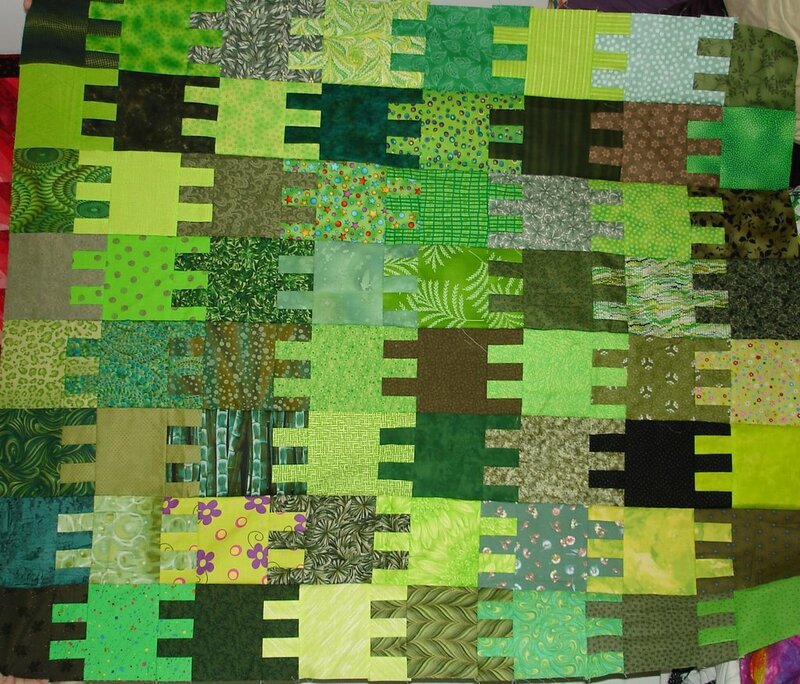 or something like yesterday's October quilt in green (only an o.k. option - I don't like to do the same thing too may times & I just did that!) - Or Maybe a Scrappy Chicklets (free pattern!) 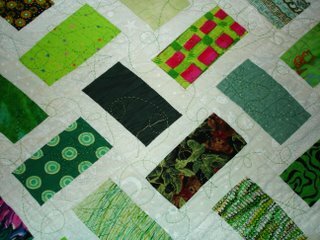 quilt with a lime green background. Or a Stargazey Leaves (or something similar) - too bad we are not going to Perth, I'd love to go to Jan Mullen's Studio - she by far hands down my FAVORITE fabric designer! 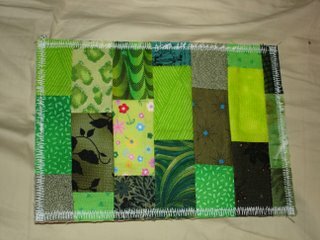 Here is a green quilt that I made about 2 years ago: It is a "Bricks" quilt. The green rectangles are bricks that measure 2.5 x 4.5 inches the white parts are "mortar" and measure 1.5 x 4.5 inches. They really are only a glorified rail fence. I swapped quite a few "bricks" in the past. The can be udes for borders, sashing & there are other block formations that use bricks. 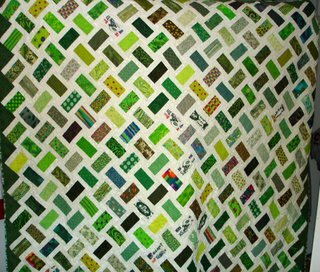 I have another bricks quilt UFO that is scrappy (charm like with no two alike - was the plan) batiks and hand dyeds with black mortar. It will be set on point. Here is a close up - quite obnoxious this big huh? This quilt was made specifically for my husband back when he was just my boyfriend. He is a Rabid New York Jets fan, hence the green and white pallette. You may even be able to make out the officially licensed NFL fabrics. The back is Officially licensed NY Jets fabric as is the wrap over binding. I set it on point - I just prefer that "look" for this type of quilt. These might get your creative juices flowing. HGTV has 4 BOMs and they are all free! Back to the more pleasant part of studying the visit before going! "The Aquarium's Australian exhibit, Animal Planet Australia: Wild Extremes, depicts amazing stories of survival in an extreme environment. The highly adaptive animals in wild Australia have survived over millions of years in a land of drought, fire, and flood. More Than a Stone's Throw AwayAustralia, roughly the same size as the United States, is the world’s largest island. Separated by ocean from the rest of the world, Australia has a higher percentage of endemic animals than any other continent on earth, meaning that many of its species are not naturally found outside the country. These animals – living creatures that are as close to prehistoric as can be found on earth – developed over millions of years in solitude. Most of us will never get within a cooee of these creatures without going to wild extremes." Sounds cool, huh? Sure has me intrigued. The exhibit appears to mainly be focusing on the Norther Territories which is fine with me becasue that is not part of our actual vacation! 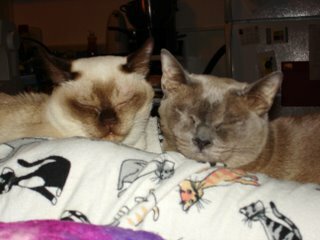 My excuse du jour for not quilting... Rhapsody & RB sitting on my lap (love those kitty PJ's - I have another pair of kitty PJ's - with a purple background) BTW I am laying on the bed and that shiny thing in the right hand corner - that is the refrigerator.) aren't they cute. How could I make them move? I can now switch thread and bobbins and start to sew down my bulls-eye flowers! 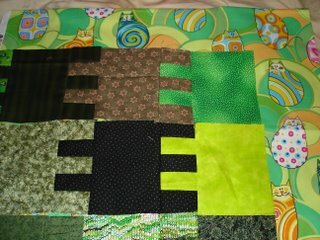 Yes, it is an April Project Spectrum quilt, but I want to finish it & in my defense, it will have green leaves! Green in the May Project Spectrum color!